CO3 aims at assessing the benefits and risks of disruptive technologies, namely: blockchain, augmented reality, geolocated social network, liquid democracy tools and gamification, in the co-creation, co-production and co-management of public services with citizens as PAs partners. Augmented Reality becomes a single shared layer on the urban paysage and part of citizen’s public life, AR enables manipulation of financial objects built on blockchains, information sharing on a map, online deliberations and so constitutes an infrastructure for service co-production by citizens. CO3 pilots the technologies’ ecosystem of in three sites. It evaluates the outcomes of the new interaction model between PA and citizens under a set of metrics in three dimensions : 1) social and cultural: citizen engagement, change in relationship with public servants; 2) economic: value of services produced, effects on workplaces, consumptions and economic sustainability; 3) legal: legal implications for PA including privacy and data protection. CO3 will devise a business plan ensuring long term sustainability for the PAs on the basis of the metrics applied on the pilots’ data. 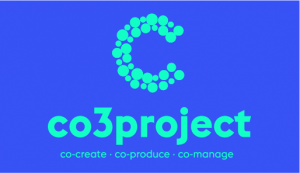 CO3 is a participative and interdisciplinary project, the Consortium involves: University of Torino (IT)(Computer Science, Economics, Sociology and Law), ISMB private research center (IT), Fundación Universitaria Balmes (ES), Institut de Recherche et d’Innovation of Centre Pompidou (FR), and OpenLab Athens (EL), with its Laboratory of the Digital Commons. It also involves three highly innovative SMEs: Brainbot, leaders in the Ethereum Blockchain development(DE), FlexiGuided (DE), the company that created LiquidFeedback, Geomotion (ES) working on augmented reality and location-based technologies. Municipality of Torino (IT) together with the Neighbourhood Houses, Municipality of Athens (EL) via its public company DAEM and the Municipalities of the Plaine Commune in Paris (FR) will be the pilot sites.